MULTICAM: Bracket done and sign primed! For the last few days my nephew and his family were visiting. Luckily Duane and his ten year old son Sid love to work in the shop and they insisted they would give me a hand. 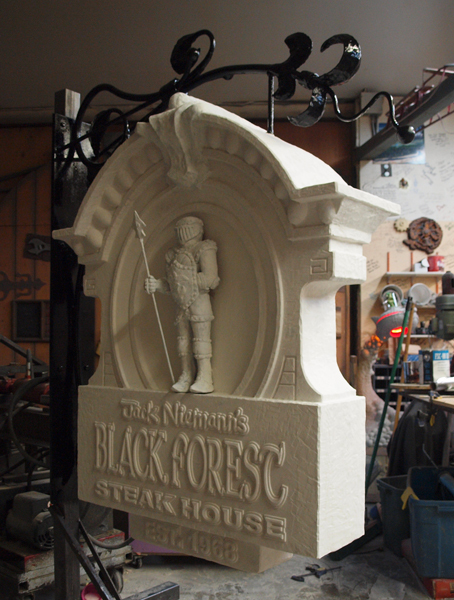 Together we finish the sculpting parts of the sign and yesterday put on a textured coat of Coastal Enterprises primer. The primer evened out the texture over the entire piece and made it impossible to tell which parts were routed and which were done by hand. The three of us made quick work of that part of the sign, leaving plenty of time to knock off for the rest of the day. After they turned in for the night I snuck back out to the shop and painted the bracket. The sign now looks positively massive, and after we paint it to look like sculpted stone it will be even more so. This afternoon the painting and glazing will begin.